Granola. Not my favorite thing, and one I am rather particular about. 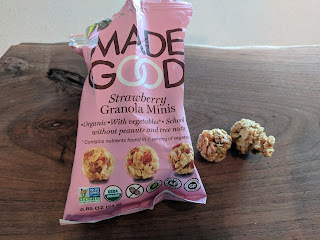 I've certainly tried my share of granola, generally in cereal form or bar form, but, it has never been my "go to" snack. For cereal form, I want the right style of clumps, the right kind of mix-ins. For bars, I want the right kind of chewy/crispy balance. I'm rarely satisfied on the granola front, although sometimes I do enjoy a greek yogurt, fruit, and granola parfait, particularly if I make it with Worthy Granola (still my favorite!). But, when I was visiting another office, I saw an interesting form of granola in the micro kitchens: granola "minis" by Made Good. They looked like little bite size nibbles. Since I'm such a snacker, this form appealed to me. Of course, the market being what it is these days, they boast all the standard claims: non-GMO, whole grains, low sugar, dairy-free, nut-free, organic, gluten-free, etc. They add in an extra goodie: they contain a full serving of vegetables. Yes, vegetables in your granola. Just go with it for now. 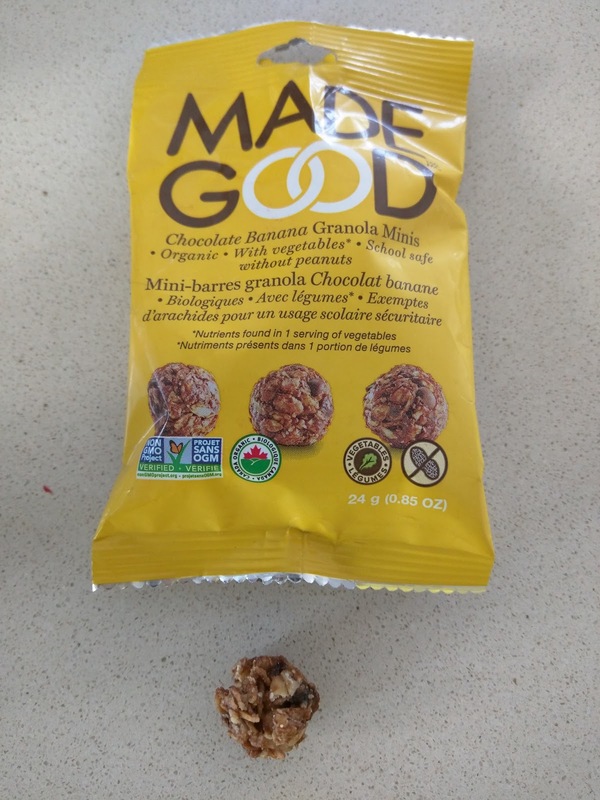 In addition to the minis, Made Good makes regular granola bars. The bars come in four varieties (chocolate chip, mixed berry, chocolate banana, and apple cinnamon). The bites also come in four varieties, randomly replacing mixed berry with strawberry, but the others are all the same. I tried two varieties, and, they weren't bad. I don't want more of them, but, they were certainly interesting to try. The aforementioned vegetables come in the form of a vegetable powder added to all varieties, containing spinach, broccoli, carrots, tomatoes, beets, and shiitake mushrooms. You can detect it, but, it is subtle, and I'm sure it helps trick some children into eating their vegetables, which I'm sure is some of the appeal. "Sweet juicy strawberries and gluten free oats. These granola minis taste like strawberry season all year." 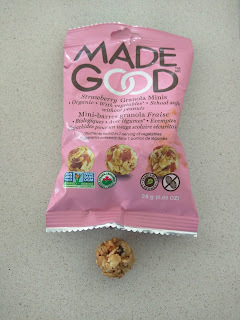 Given the variety, I was a bit surprised to find dried apples and apricots in addition to the strawberry bits. The base also contained oats and other standard granola fillers (sugar, agave, oil, brown rice, tapioca flour), and then of course, the vegetable powder. They were ... fine. 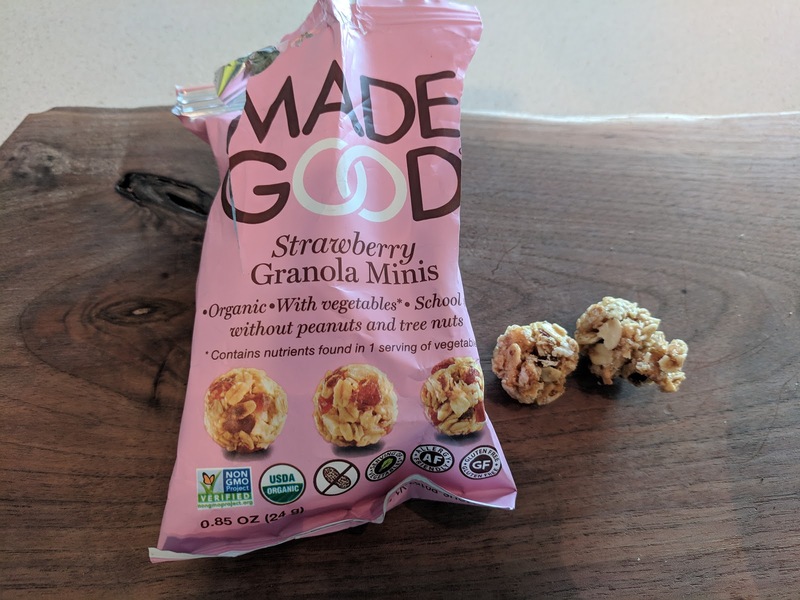 I loved the idea of mini, munchable granola bites, since I love snacking on granola, but, for some reason, I didn't love these. Lots of fruity flavor from the bits of dried fruit, but, they were a softer style overall, not as crispy as I like my granola. Overall, fine, but, just not quite what I was after. I sorta wanted to put them on ice cream or something as a crumble top. I tried these again years later to see if I, or the product, had changed. I again thought they were fine. Just fine. The bits of dried fruit were nice chew, I didn't taste strangeness from the veggie in there, but, they were again just a bit too soft. A concept I like though, I like snackable granola, and always go for the chunks in my regular granola. "Rich dark chocolate and ripe bananas. These granola minis taste just like dessert and contain the nutrients found in one full serving of vegetables." Next I tried the chocolate banana flavor. The base was standard oats, sugar, oil, crisp brown rice, tapioca flour, and agave, this time with banana and chocolate chips mixed in. I was much happier with this selection. They were crunchier, and tasted like chocolate chip banana bread, just in crunchy granola form. There was a slightly strange chew to them though, that I couldn't quite place. It seemed like there was dried fruit in them, but there wasn't. They weren't crispy or chewy, just, somewhere in-between. There was also a slight strange flavor, sorta like when you have some kind of quickbread and find out someone snuck zucchini in it. This no doubt came from the vegetable powder (spinach, broccoli, carrots, tomatoes, beets, shiitake mushroom). It wasn't bad, and it was very subtle, but, slightly detectable. When I first moved to the Bay Area, one early lesson I learned was about rituals different folks have for driving to/from Tahoe in the winter. And by rituals, I mostly mean coping mechanisms. For many, the answer seems to be a stop at Ikeda's California Country Market (with locations in Davis and Auburn). Ikeda's is a "country market"with gourmet food products including all the snacks you may need to survive the journey, plus a bakery, and a restaurant. While all aspects of the business are well regarded, it is the bakery that people swoon over. And, in particular the pies. The restaurant is open for breakfast, lunch, and dinner, and serves basics like burgers, sandwiches, and shakes. Plus, the pie. Oh the pie. Ikeda's has been on my radar of places to visit when driving to/from Tahoe for years, but, I haven't actually done that trip in a long time, so somehow I still haven't ever made it, even though for dessert loving me, this was high on my list. But, this season, one of my co-workers stopped on their way home one Sunday afternoon, and brought us a pie Monday morning. For breakfast. I didn't object. "Fresh Granny Smith and Golden Delicious Apples picked from our own orchard a mile away from our Auburn location. They are peeled, sliced, and baked to perfection in our in house bakery." 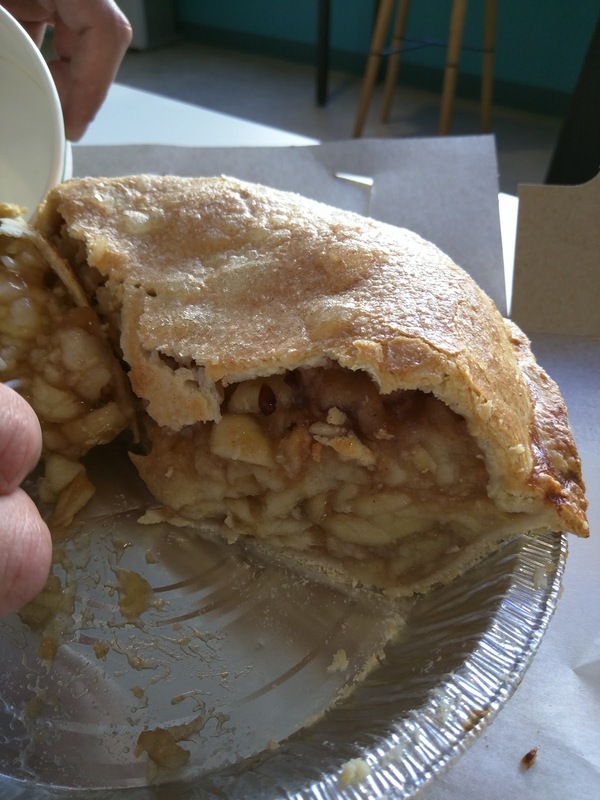 As I mentioned, Ikeda's has three varieties of apple pie, and it is the classic that my co-worker selected. I'll be honest, apple pie is one of my least favorite pies. I don’t really like apples. And I’ll be honest, usually if my only option is apple pie, I’ll get the pie, and mostly eat just the crust. I rarely bother finish the filling, as soggy apples just aren't my thing. Enter Ikeda's apple pie. The filling was clearly the appeal, sky high. I started with the crust though, double crust. It was … fine, but not remarkable. Not particularly flaky or anything. But the filling? That WAS remarkable. The apples were thinly sliced, and perfectly cooked, still a bit crisp. I think the mushy quality of most apple pies is one of the reasons I rarely like it. And the apples were still tart, granny smith was a great choice of apple for this pie. The tart apples complimented the sweet sauce they were in perfectly. Now let’s talk about that sauce. Sweet and cinnamon-y. Thick and a bit gooey. It totally coated the apples and was really, really tasty. All together, this was a fabulous pie, and probably the best apple pie I've ever had. I'd love to try another one of their pies, ideally, a variety that I would actually pick! As you know, when I visit Sydney, I love to eat as much Thai cuisine as possible. I go for the whole range, from pricey fancy full service restaurants to street food sold from a Hawker. 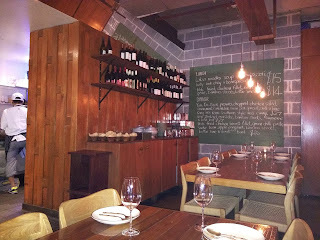 Most of my visits are concentrated around the Thai Town area, as it has the highest density and what seem to be more authentic establishments, but I'll venture anywhere, like last week's review of our banquet dinner at Longrain in Surry Hills. This week's adventures are also to Surry Hills, but to a far more casual place, and with only a group of 6, to Muum Maam. I'll be honest, part of the appeal of Muum Maam for me was the dessert menu, with very fun sounding creations like "The Sticky Stack" and "Monkey Balls". Overall, Muum Maam was fine. 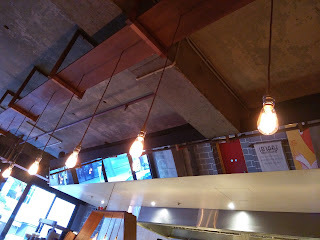 The food was fine, the prices were reasonable, service was ... ok, although really quite timid, with the server holding back until I made eye contact and summoned him over every time. All dishes were served family style, and brought out as soon as they were ready, at a nice pace. I don't see any particular reason to return however. During lunch time, Muum Maam operates in an even more casual mode, more like a tuk shop, and, I believe they use this front register to process the quick lunch takeaway transactions. 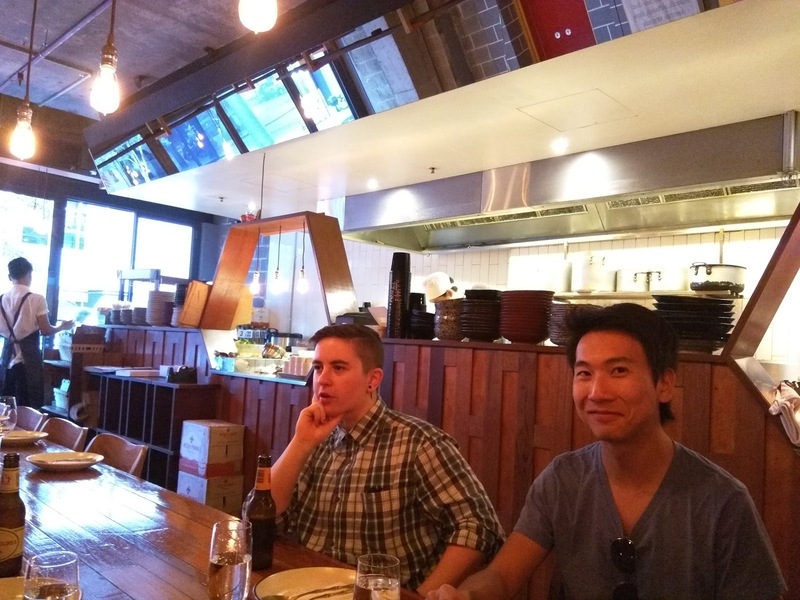 The interior space is furnished with large wooden tables, most only capable of seating up to groups of 4. Since we were a group of 6, we were seated at a long communal table. Muum Maam treats the communal area nicely though, rather than just fitting in as many seats as possible, they put real breaks between groups, so, even though other groups were seated at the same table, we still had some space between us and them. I wish more places would do this, although I realize it does reduce the number of parties they can seat. The kitchen is behind the long half-wall you see here, so we could quasi-see into it. 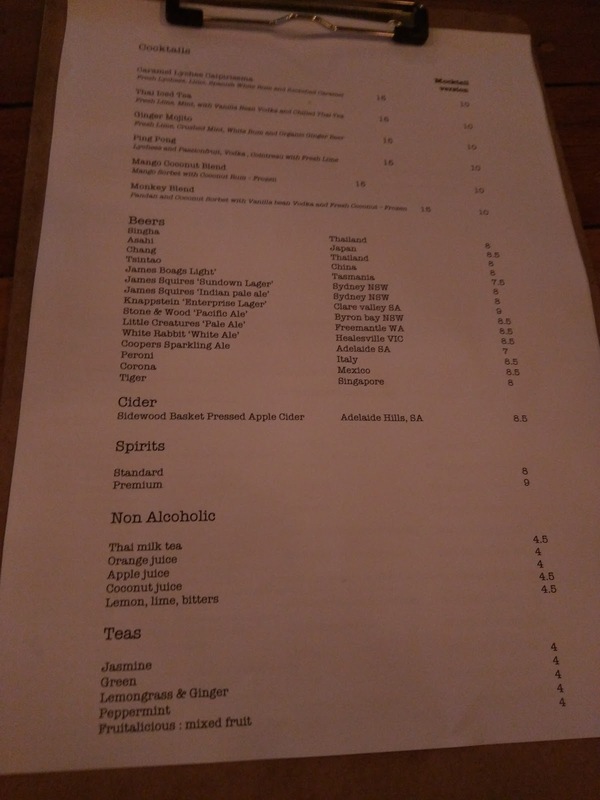 The other end of this section had the bar contents on display. The lights are bare lightbulbs hanging from the ceiling. Ojan really liked these, and wanted me to make sure to include it in the review. So, there you go. Lightbulbs. I also noted the music selection, classical, which made for a very relaxed environment. 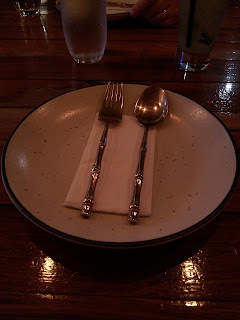 Place settings were not particularly notable, a spoon and fork, with bamboo stem design. Drink choices included a decent beer selection, some non-alcoholic options like thai milk tea and juices, teas, and cocktail. Of note is the fact that every cocktail was explicitly available in a mocktail version for $5 less. I was fairly tempted by some of the more fun sounding options, like the "Monkey Blend" with pandan and coconut sorbet, vanilla vodka, and fresh coconut, obviously a frozen concoction, but, given the meal, and my plans for all the desserts ahead of us, I went for something a bit less decadent, no sorbet included. "Fresh lime, crushed mint, white rum, and ginger beer." 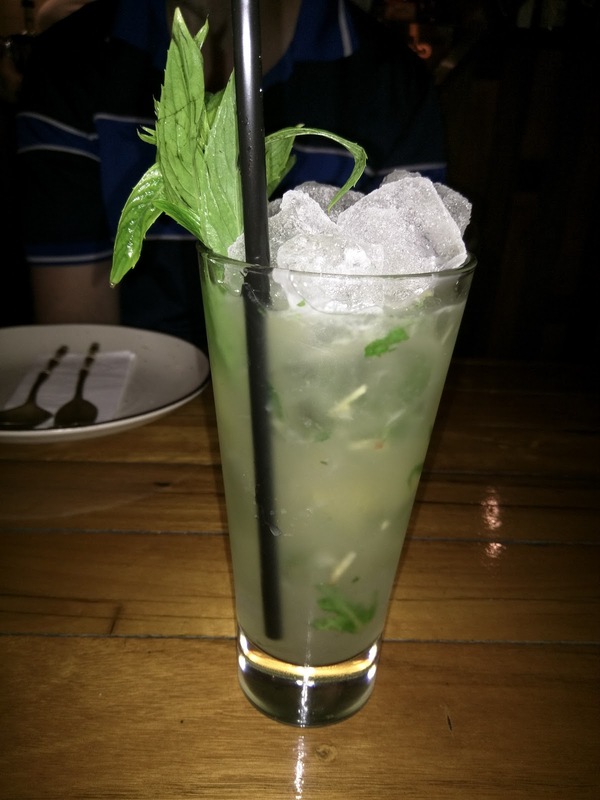 I was quite pleased with my cocktail, actually one of the best I had in Sydney. Inside my glass were several halves of lime and a huge amount of fresh mint. There was also muddled mint, but I wanted more of it muddled, which, I somewhat did myself with the straw. Anyway, the drink had a really nice ginger flavor and was minty, making it really refreshing. It was a tad bit sweet at first, but as the ice melted it balanced out quite nicely. I really enjoyed the drink. The food is all designed to be served family style and shared, which I always like, so I can try many dishes. It wasn't until we started discussing the menu though that I realized we had a slight problem. In our group of 6, two people did not eat pork, and two did not eat shellfish, one of whom doesn't eat any seafood. The menu was ... mostly seafood and pork, and, literally everything I intended to order, sans dessert, was seafood. Doh. Anyway, the menu is fairly large, and not broken into sections, no appetizers, entrees, sides, etc, so there were plenty of choices to satisfy the group. All items were just one big list, but, you could kinda guess by the prices as to what sizes dishes would be. 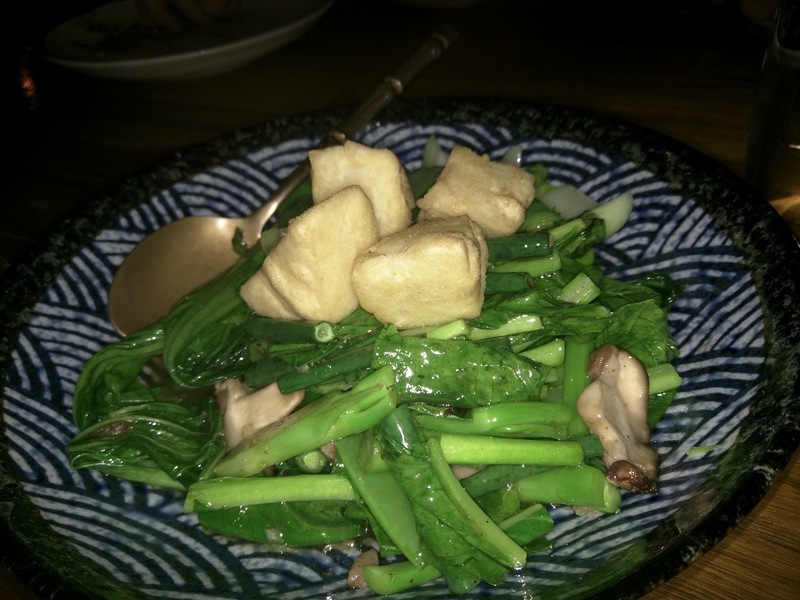 We settled on a bunch of stuff, including vegetarian items to satisfy our non-pork and non-seafood eaters, and some seafood dishes to satisfy me. I think there was only 1 person who actually wanted all the dishes, but this worked out fine, as people just ate what they wanted and there was plenty for all. Dishes came out one by one in a somewhat random seeming order as they were ready. I appreciated that they were all hot and fresh, but, I felt they could have ordered things a bit better. Anyway, on to the food! 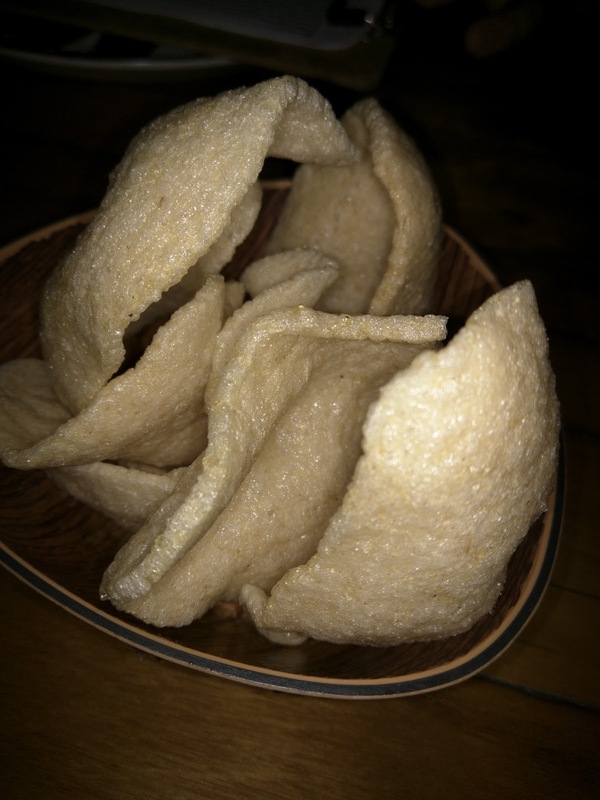 Soon after we were seated, a bowl of little chips was brought out, I think fishy. They were fine, nice to crunch on, and, the others quickly devoured them, as they hadn't been snacking all afternoon like me ... oops. Crispy crab and prawn rice net spring roll with house plum sauce. $13. This was the dish I was most excited to try, as I'd seen photos of it. Fried spring rolls are fine in general, but here they took a different approach with the rice net surrounding the roll, and I was very curious how this would work out. Ojan dug in first, picked one up with his fingers, and exclaimed in pain. Piping hot. I waited a few minutes, and I too hurt my fingers. It was such a tease, having this fascinating looking spring roll sitting there, and feeling like I couldn't eat it! 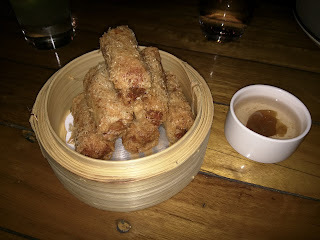 Anyway, as for the spring roll, it was ok. Super crispy exterior, and some fishy flavored filling. I couldn't really distinguish crab or prawn though, which was sad, as I do love crab. The house made plum sauce on the side was incredible, super flavorful, sweet and tart, with a big plum in it. The sauce was delicious on absolutely everything. I made sure to save it after the server went to clear away the empty serving dish, so I could keep using it with other dishes. That plum sauce was the most memorable part of the meal. I also devoured the plum itself, soft, naturally sour, but also dripping in sweetness from the sauce. Oh so tasty. The plum sauce alone made this my second favorite of the savory dishes. 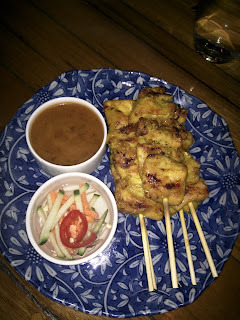 Grilled chicken skewers with peanut sauce. $13. This dish normally comes with 4 skewers, but we had 6 people (and 5 who wanted one), so, the server thoughtfully asked how many we'd like, and adjusted our order to accommodate. Of course, I don't like chicken, so I didn't have one. But the others were quite impressed, commenting, "These were shockingly juicy, not dry in the slightest" and "Really moist chicken!" They also noted that something was slightly spicy. 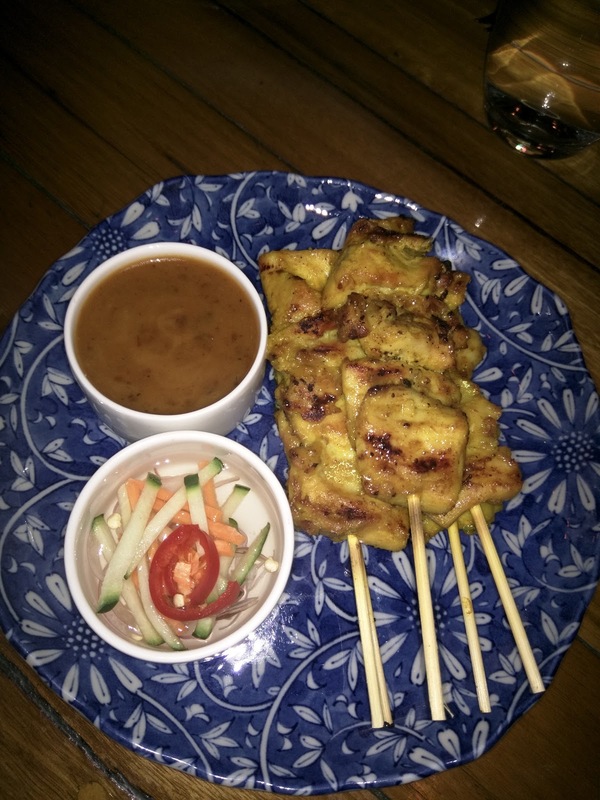 I did try the peanut sauce, since I love peanut sauce, but found it unremarkable. Same with the little side of cucumber and chilis in vinegar. 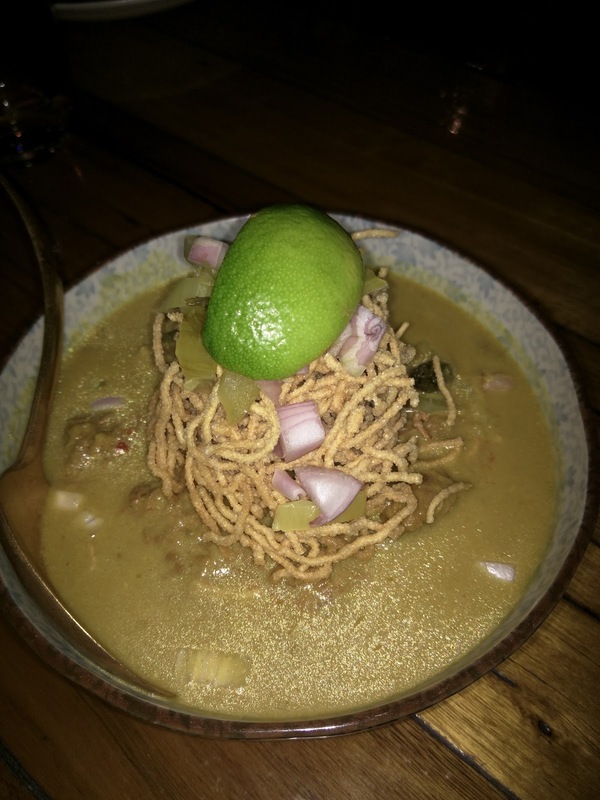 Northern style crispy egg noodles and slow cooked beef curry with pickled cabbage. $24. This was the other dish I had my eye on, since I love textural contrast, and wanted to see how the crispy noodles turned out. The noodles were great, super crispy when the dish arrived, clearly sprinkled on at last minute. But then they got quite soggy as they soaked up the curry. When crispy, they were awesome, but, in a soggy state, not so much. We did not find any of the "pickled cabbage" included in the description. Not on top, not mixed in, just, not present. But the curry sauce was good, great flavor, sweet, coconuty. I enjoyed dipping the crispy noodles into it. The beef was kinda meh, but, the curry sauce was good enough to make this my first pick of the savories. Salt and pepper calamari with sweet chilli sauce. $18. Whenever I'm in Sydney, I seem to eat squid, calamari, or cuttlefish at nearly every meal. It is everywhere! 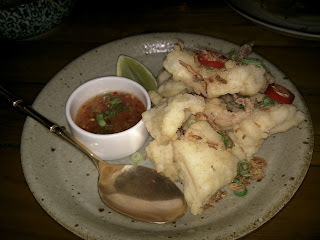 So here we had yet another preparation of calamari, battered and fried, with spicy little peppers and sweet chilli sauce on the side, along with a lime to squeeze over. The calamari was nearly as hot as the spring rolls, and I really appreciate how they served items as soon as they were ready, even though it meant we got the calamari after the curry, which wasn't the order I was expecting, since it seemed like more of an appetizer. The calamari wasn't great though, it was kinda rubbery, and the coating slipped right off. There was a good mix of body and tentacle pieces. I decided to nibble on one of the red peppers, and I assure you, these were very spicy. It took a little while for my mouth to recover. Since I love sauces so much, you might be starting to realize why I was drawn to Muum Maam ... nearly every dish had a sauce with it! But this sweet chili sauce was unremarkable. Continuing the theme on this trip of Ojan ordering extra veggies to get more fiber, we got the fairly boring stir fried asian greens. There was a mix of assorted greens and snow peas, a few slices of mushrooms, and tofu, in a light sauce. The greens were fresh and nicely cooked, still crisp. I liked the slices of mushroom, but there were only a handful in the whole dish. The sauce was salty, but had a nice soy flavor to it. Overall, not interesting, but, I didn't expect it to be. This was vegetarian. I was surprised by the $17 price, particularly compared with everything else. How was this dish of veggies, in a simple sauce and not complicated prep, one of the more expensive items we got? Next was another vegetarian selection, ordered not because we had any vegetarians in our group, but because we we had so many non-pork and seafood eaters, there weren't that many other choices. We ordered this to compliment the salt and pepper calamari for them. I didn't actually try it, as I was quite full at this point, and was really, really looking forward to dessert. Plus, the non-calamari eaters really liked this, so, I wanted them to have it. 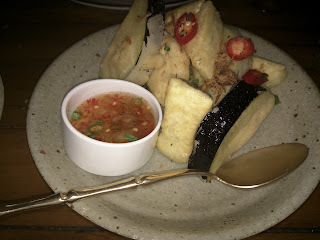 Ojan thought the eggplant was really good, information he volunteered without me asking, always a good sign. They all loved it though, remarking that both the tofu and eggplant were excellent. 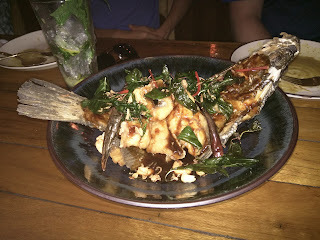 Whole fried barramundi, Tamarind Version. $34. For our whole fried fish, we had two options, "tamarind sauce, crisp lime leaves, whole dried chilli & cashew" or "red curry sauce, snake beans, thai eggplants and kaffir lime." The group opted for the tamarind version. I looked through into the open kitchen after we had ordered this, and watched the chef indeed pull out a whole fish. He brought it to the sink, cleaned it, and pulled out a big knife. Amazing. This really was a fresh fish! Like many restaurants, the whole fish skeleton was used as the serving vessel, the stir fried fish piled back in. The tamarind sauce was very thick, sticky, sweeter than I expected. I of course couldn't resist eating the whole dried chilies. They had a lovely smoky flavor to them, which was total danger to me, because I loved it, and didn't quite notice the heat building until my mouth was on fire. The sweet sauce helped counterbalance that. Also in the mix we had cashews and crisp lime leaves. The leaves were too fried and oily for me, but I kept wanting to like them, as something to just munch on. 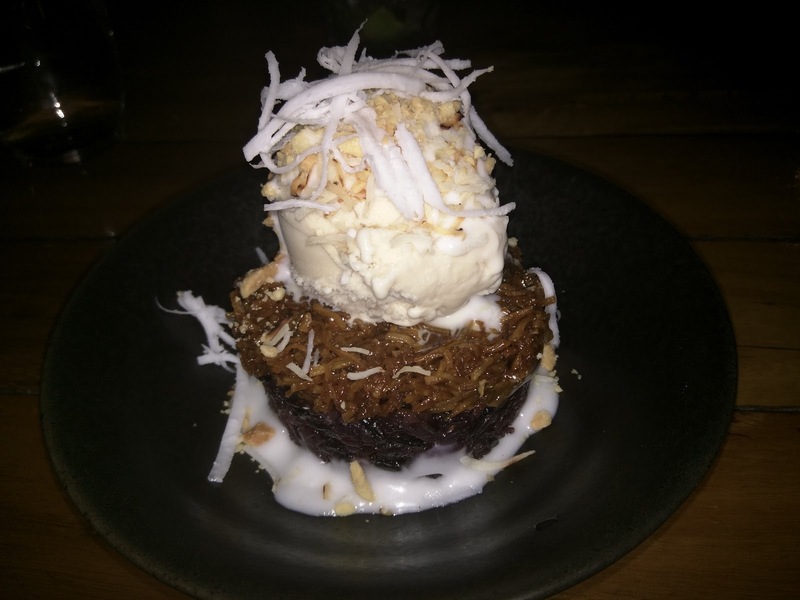 "Black sticky rice, coconut jam & peanut gelato topped with toasted coconut and coconut milk." And now, for the awesome sounding desserts, the feature of any meal for me. The base here was warm black sticky rice, nicely cooked, nicely sticky. On top of that was the coconut jam, a thick layer of sweet coconut. I could have done without this layer entirely, or at least, half as much. Just too much coconut for my taste. Next up was the peanut gelato, fairly creamy, good peanut flavor. Peanut, black sticky rice, and coconut don't necessarily go together in my mind, a somewhat strange choice, but, they did work well enough. On top was more toasted coconut, and there was coconut milk drizzled on the plate as well. Overall, this was pretty good, and we all devoured it easily. Warm sticky rice, creamy ice cream, and some extra sweet stuff, not much to complain about, but, as I said, I wanted less coconut overall. 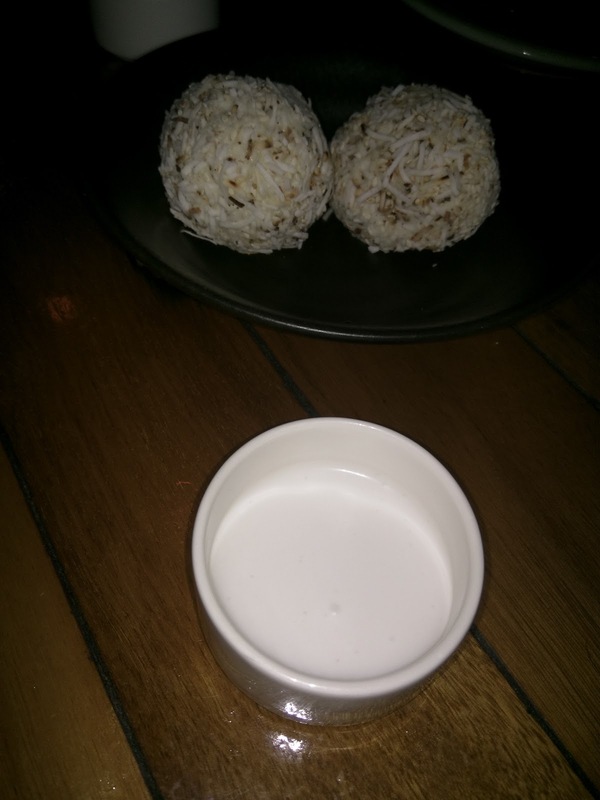 "Caramelised cashew nuts surrounded by pandan & coconut gelato then coated in toasted coconut and white sesame"
We also got several orders of "Monkey Balls", served two to an order, with a side of white sauce. These were not at all what anyone expected. In the center-ish was a glob of caramelized chopped cashews. These were sweet, crunchy, and delicious, but there really wasn't much of this component. Around the nuts was the gelato, with a nice subtle pandan and coconut flavor, but, it was pretty icy. The balls were rolled in more coconut and white sesame, very generously coated. Again, too much coconut for me. I still am not entirely sure what the white sauce was. It was sweet, but didn't actually seem like coconut milk/cream as I expected. I'm also not really sure if we were somehow supposed to break apart the balls and dunk into it? Or pour it over? It wasn't listed on the menu, but, we had a bowl with each set of the balls, so, clearly, it was meant to go with. I really liked the filling of the balls, and the gelato flavor, but, the icy texture and the coconut made this my second pick of the desserts. Last week I shared with you a review of some interesting sounding baked goods I got via a service called Zaarly. 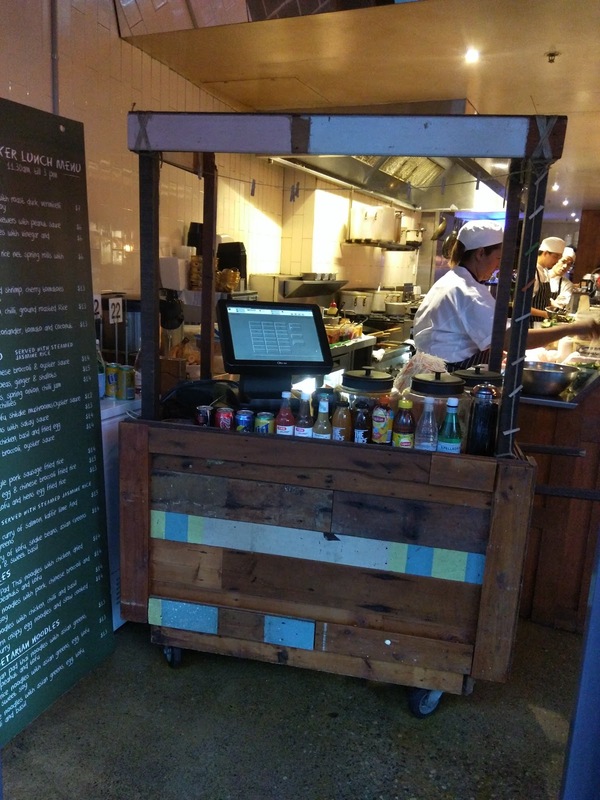 As I mentioned then, Zaarly no longer offers food products, but, when they did, I tried some very interesting jams and sauces from a vendor named Eva Rodrigo. I'm not able to find any information on her current shop, so I think she must no longer be producing these products, but, they really quite unique and tasty. Caramelized Onion & Pedro XImenez Compote. $11. 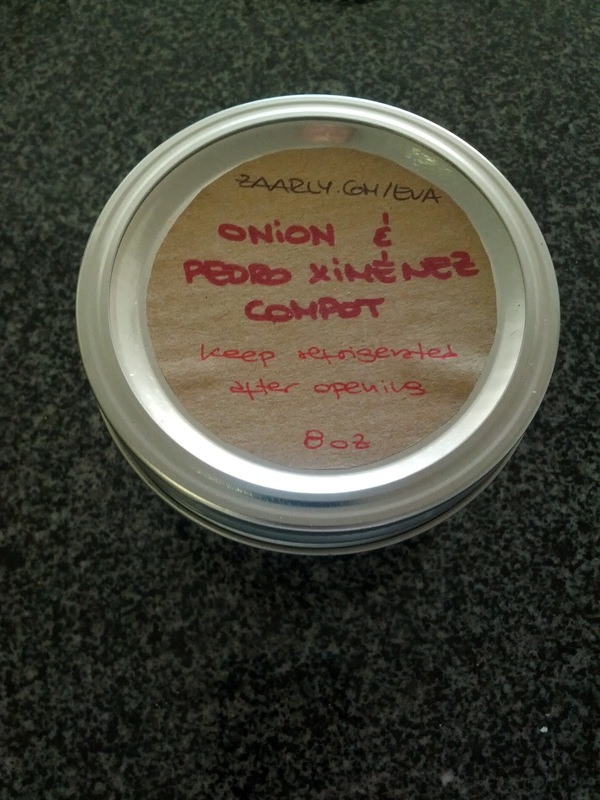 "Caramelized onions with a reduction of Spanish wine in an easily spreadable jam. Great for bread, cheeses, meats, but specially with foie gras." Well, this one had my name all over it. Perfect with foie gras? I was in, and quickly bought a jar. It was absolutely delicious. Deeply caramelized onions, really complex flavor from the wine. Yes, it was great paired with foie gras, but it was also delicious spread on bread on its own, or with cheese. Strawberry & Aged Balsamic Jam. Tasting notes: This was a really great jam. Full of chunks of strawberry, but balanced by the balsamic. It was delicious on bread. If I didn't have jars and jars of my mom's homemade strawberry jam, I'd get more of this. Campari Tomato & Saffron Jam: Tasting notes: Also absolutely delicious, almost like a tomato sauce, but thicker. It was great on bread, with cheese, and particularly combined with the caramelized onion jam too. My second favorite for the spreads I tried. Salsa Romesco. "Roasted red peppers combined with ground almonds, hazelnuts, olive oil, tomatoes, chili peppers and vinegar to make a smooth, rich sauce that tastes great simply spread on a slice of rustic bread." Tasting notes: I normally like romesco, but this didn't do it for me. The only spread of hers that I didn't love.